New Zealand has a vast land snail fauna. Most widely known are the giants, Powelliphanta and Paryphanta. But the majority of species have shells smaller than 5 millimetres. 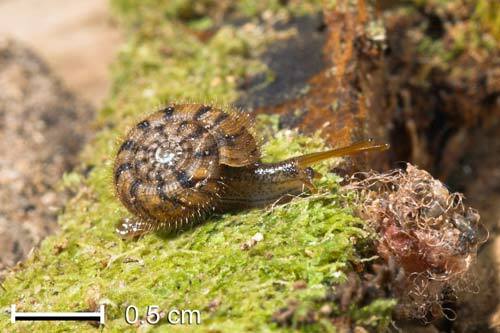 Suteria ide, pictured here, is one of a small number of New Zealand land snails whose shell grows to more than 5 millimetres. Land snails have varied shapes and sizes. Some have ridges, ribs and in the case of some species such as Suteria ide – bristles. The ridges, ribs and, especially, the bristles are thought to reduce the amount of dirt and water that adheres to the shell.